As well as Cash and Check. Dixie Plumbing has been faithfully servicing the plumbing needs of Palm Beach County residents since March of 1972. Serving both residential and commercial customers, Dixie is licensed and insured. Our team of licensed and trained residential and commercial plumbing professionals is fast and efficient, and can handle just about any job, big or small. It is this experience that has made Dixie Plumbing a trusted and recommended plumbing service and new construction company for over 40 years. At Dixie, we know plumbing! From minor repairs to major rennovations, Dixie Plumbing is a full service plumbing company. When you hire a Dixie Plumbing plumber, you are assured quality service from a consummate professional. We're prepared to stand behind our work and guarantee excellent service and 100% customer satisfaction. 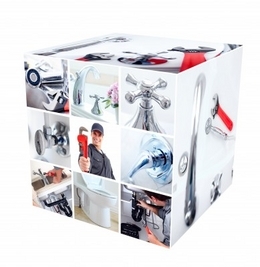 When plumbing problems occur in your home or office you need a plumber you can trust, call us. At Dixie Plumbing we know that having a plumber you can trust is important. We think that longevity with a company plays a significant part in assuring that trust. Click here to find out more about our our staff. Looking for a residential or commercial plumbing remodel or interested in a bid for a new construction project, please call Dixie Plumbing at 561-746-4504. Interested in job opportunities, click here for an online Job Application.